Everyone needs a little hand once in a while. There seems to be a consensus among a certain group of artists that the measure of your ability can be found in the ease with which you draw realistic looking human hands. Drawing the comic has smoothed this skill over for me. (Yeah, I know the characters in the comic only have 4 fingers. But still.) Hands never seemed that great of a challenge to me–it’s face that give me trouble–and now my brain knows how to visualize the reproduce a variety of hand positions. If I can look at my own hand, or someone else’s hand, or a photo of a hand, then it always comes out right. 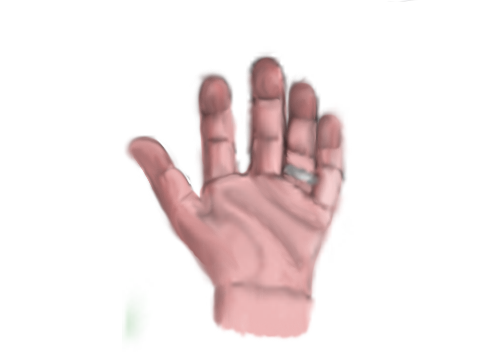 This is my left hand, which I did in digital paint as a tiny image a few weeks back. It took only a few minutes. Then I blew it up and smoothed it out just now, which only took another few minutes. Of course, I could have messed with it for 4 hours and made it look even more realistic. I probably could have messed with it for 18 hours and made it look like a some kind of uncanny volar valley, something that looked almost, but not quite, like a photograph. Wherein lies my problem: given enough time, I can draw anything. But then time becomes an issue. In 4 hours I could draw one perfect hand. Or one imperfect comic. Lately life has been overwhelming and my brain doesn’t seem interested in drawing, or anything at all. It’ll probably pass. But producing new stuff seems just out of reach right now. I do have an article about censorship coming out today on Panels, but the link won’t be up for a few more hours, so I’ll post it later. There’s half a comics script on my desk, and with a little effort it could be a real comic by tomorrow. This entry was posted in sketches and tagged ability, digital paint, drawing, drive, failure, hands, skill, success, talent, time, wacom tablet on June 22, 2015 by littledragonblue. I am not going to tell you how to color correct images in Photoshop, because my knowledge is insufficient for instruction purposes. 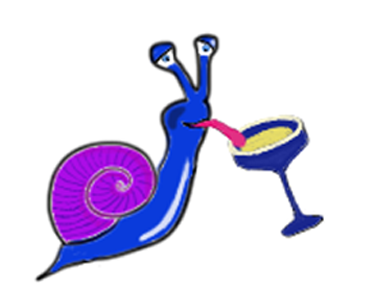 Just starting out: I’m just feeling my way and going about it in a rather haphazard manner. A couple weeks back, my friend the Vampire Bat saw a picture I took of a hummingbird and color corrected it, and the difference is sort of amazing, so we talked for 30 seconds about it and I was inspired. I took a slightly less awesome hummingbird picture last week and decided to give it a shot. After I finished, I did a more subtle correction on a picture of an Arizona cardinal. 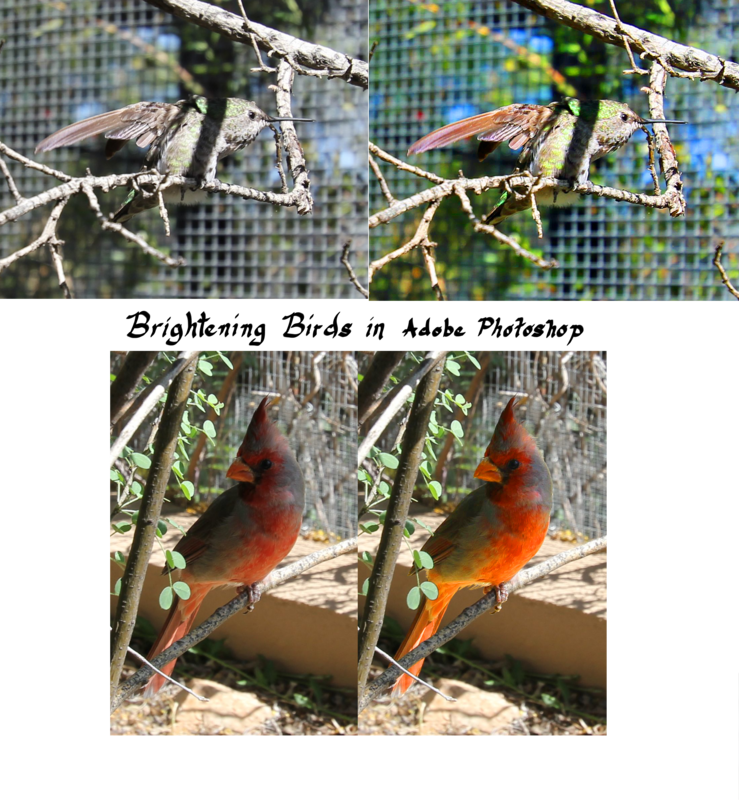 Brightening Birds in Adobe Photoshop; originals on left, color corrections on right. To my eye, the hummingbird might be a bit too bright and the cardinal could be brighter, but they both definitely look better than the originals. I shifted everything blue-green in the first picture, but I only changed the color of the bird in the second. I also enjoyed practicing that tiny bit of digital calligraphy, which I tried one time when I first got the tablet and then forgot all about as I struggled to figure out how Photoshop worked. Since most people use that program more for the color correction and less for drawing horrible webcomics, I was really feeling my way and probably not learning things in the same order as other people. The Man also required some brightening. 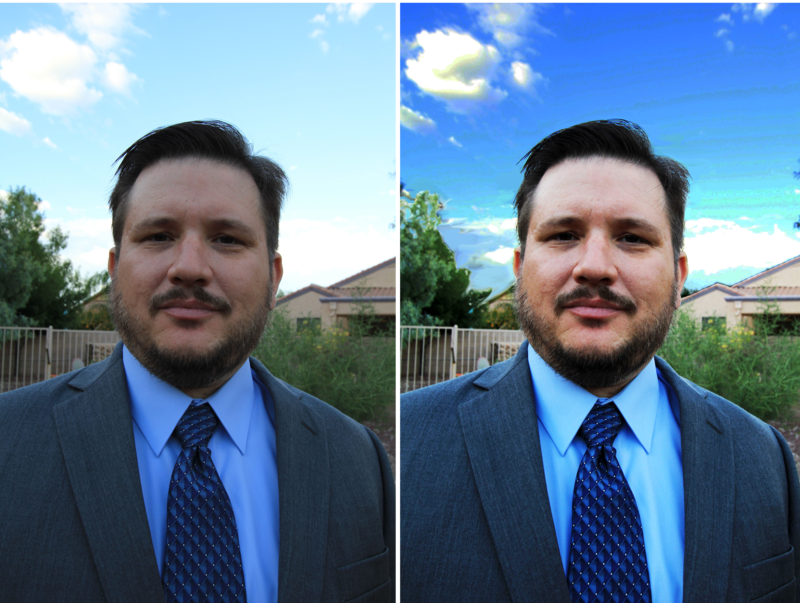 Here you can see some sort of over-the-top work I did for The Man, who wanted some professional head shots. I made a few mistakes, including causing the tree to look sort of unrealistic, but he liked it well enough to use it. It’s interesting to see what details pop out; I definitely have many sky photos that could use this treatment. Not sure what to do about his skin, though. For this image, I selected the sky first, played with that, then selected the inverse and worked with that section. Anyway, like I said, I couldn’t exactly tell you what I did to achieve these results. It was sort of random button pushing, but I think I’m learning. This entry was posted in wacom tablet and tagged color correction, digital paint, photoshop, wacom tablet on May 19, 2015 by littledragonblue. Green Vegetal Forest Spirit: Forest spirit. 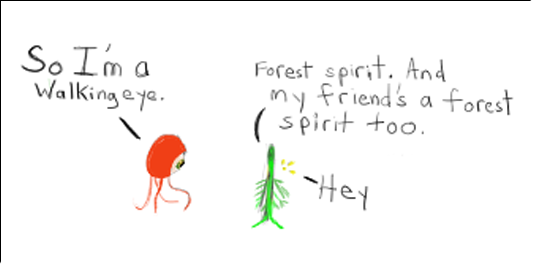 And my friend’s a forest spirit too. For a while now I’ve been doing a lot of the same thing, and I’ve learned a lot doing it, but ordinarily, when I’m just drawing to draw, I don’t draw the same thing over and over. There are definite themes, and there are topics that I mine again and again, but when I draw, for instance, Little Red Riding Hood, today’s Little Red is a different Little Red than yesterday’s Little Red. 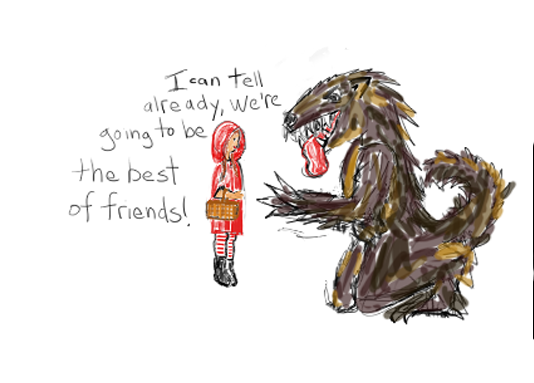 Little Red Riding Hood: I can tell already we’re going to be the best of friends! Although, there does tend to be a lot of sexual tension between the girl and wolf. There are lots of birds and fish and flowers and stars. 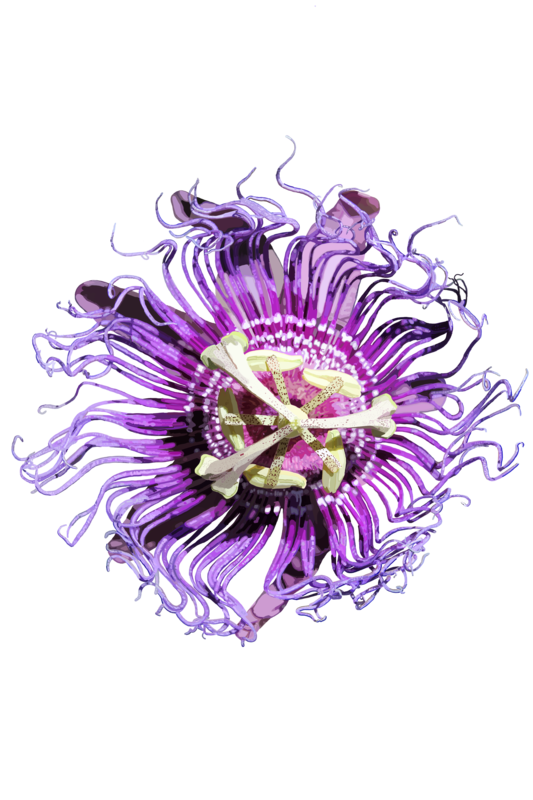 Animals and fruit come up as often as fairy tales, and the style tends to be fluid. My friend the Vampire Bat once remarked that my art doesn’t have a recognizable style–this changes from image to image, I guess because I’m still searching for my style, or rather, I’ve never been satisfied with the way I draw. This is basically the way I draw when I’m not trying to draw like someone else. 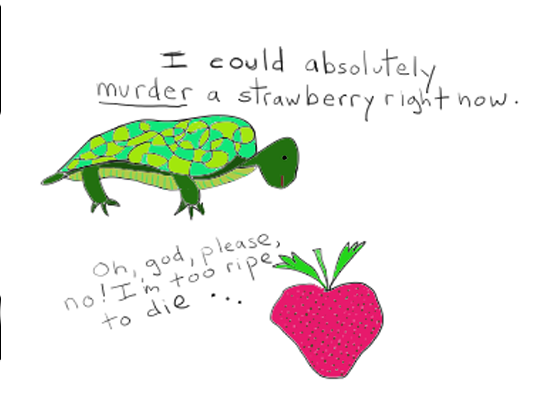 Turtle: I could absolutely *murder* a strawberry right now. Dragon Comics are fun, but these are the kind of comics that I draw constantly, without thinking about it. They don’t take hours. They don’t always make sense, although usually that’s part of the humor. They sort of make sense to me. And they always amuse me, which is the standard, right? Usually I scratch stuff like this out on the backs of junk mail envelopes, keep them around for a couple months, perhaps thinking that the designs could aspire to be something greater, and then, eventually throw them in recycling when I find them jammed under the leg of my desk covered in cat hair. 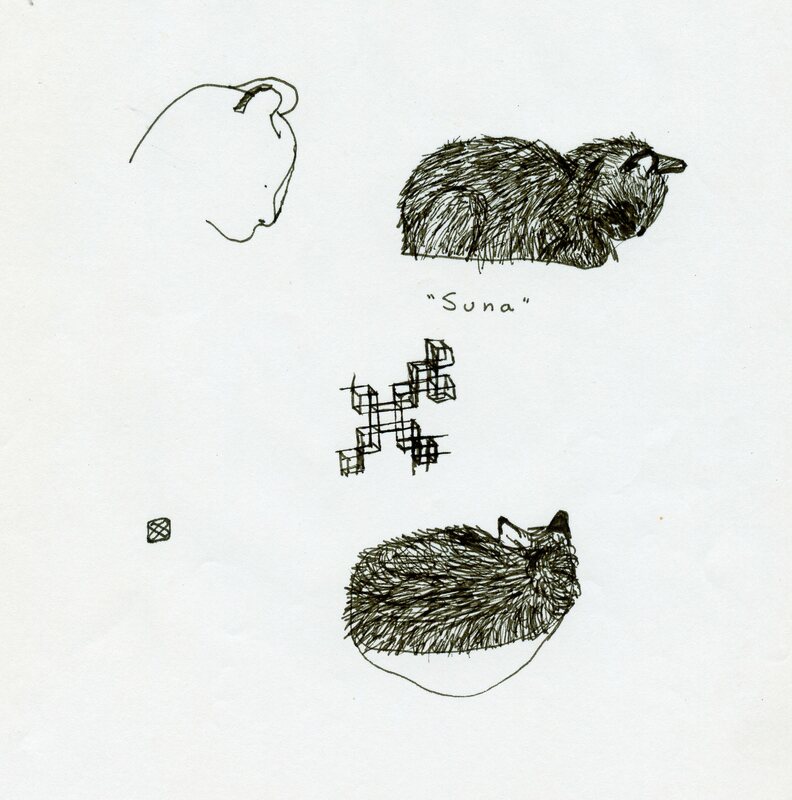 I’ve got dozens of notebooks from high school and college, the margins filled with these little guys. I’ve been thinking I should do something with my favorite parts and recycle the rest of those notebooks, too. When I first started with the tablet, little cartoons like these would come out very rough and basic. I sort of advance in fits and starts: learn a few things, get comfortable with them, get dependent on them, then suddenly realize that there’s more to learn. Then I pick up a couple more techniques. Probably it would be more efficient to read a book about Photoshop and the manual for the Wacom Tablet, but that’s just now how my mind works. I’ve got to figure it out myself. This entry was posted in Comics, sketches and tagged art, comic, digital paint, doodle, photoshop, sketch, wacom tablet on April 7, 2015 by littledragonblue. My soul isn’t perfect; why should my mandalas be? One of the reasons that crayon mandalas became less prevalent in my day-to-day life is that I felt I was reaching the limits of the abstract form and beginning to repeat myself. The representative ones were still original, but those take a lot more forethought and don’t spill out in the same organic way as the purely geometric ones. When I did last week’s mandala on the tablet, I had to start over again with the form in some ways. I had to let go, again, of the idea of perfection. Now I start to see more possibilities. With crayon, what’s done is done. You can stack a little bit of color with Crayolas but not with great detail. You can’t really go past a certain level of detail in crayon, whereas the tablet lets you get down to the pixels, and, of course, to add layers, so that you can always get something on top of whatever you’ve done. So that’s what I’ve been exploring here, and I’m actually much happier with the result than I was with last week’s circles. Something about the dots and lines reminds me of various types of indigenous folk art. I think I can really start to get even more impressive results, and hopefully come up with something T-shirt worthy. In the real world, I still have a few more days in the cold place, although it has been warming up. Crocuses and snowdrops and narcissus–the first flowers of spring–are just poking their heads through the soil, and everywhere you go, landscapers are trying to untangle the mess of this unreasonable winter. It’s increasingly difficult to function; sleep is elusive here, in a narrow bed, without The Man, without some of the comforts of home that help me sleep. It becomes debilitating very fast. Maybe tonight will be the night that I sleep for 8 hours without interruption. This entry was posted in mandalas and tagged digital paint, flowers, mandala, rainbow, wacom tablet on April 2, 2015 by littledragonblue. If you squint, it’s practically perfect. Here’s my confession: it was time to upload Thursday’s mandala, except the crayon series is, of course, hard copy, and we’re caught up with the scans. I would have had to get up off the couch, turn on the scanner, plug it into the computer, open the scanning software, find the next mandala in the series, pull out the scanner from the shelf and then get the paper into it without hurting the scanner or the paper, scan it, refile the original, uncouple and turn off the scanner, close the software, and then upload the file. And this all seemed like an unconscionable amount of work. 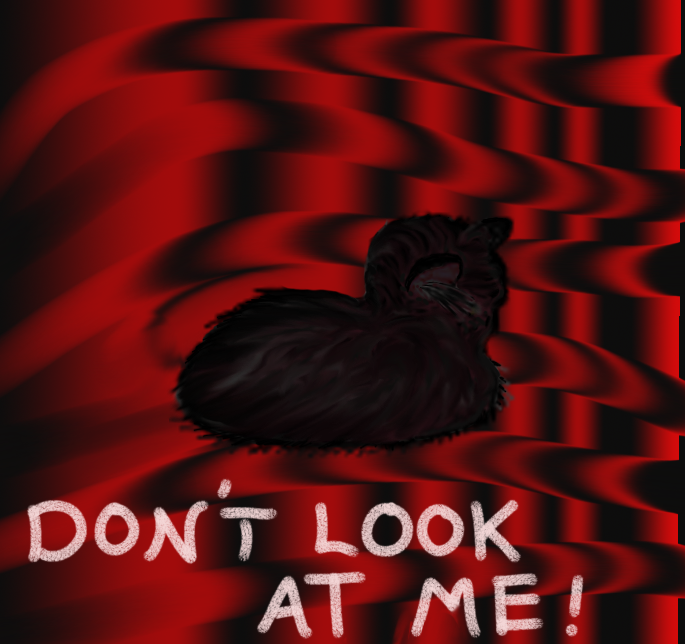 So I drew this one instead, because the tablet was already plugged in; the stylus was already in my hand. I have not gotten off the couch in nearly 4 hours. This is really not something to be proud of. Up close this design looks pretty amateur hour, especially compared to some digital work you see, but if you shrink it down or look at it from far away it’s not bad. I still did it freehand so it feels like mine but I think I can get more impressive results with better technique and more knowledge. 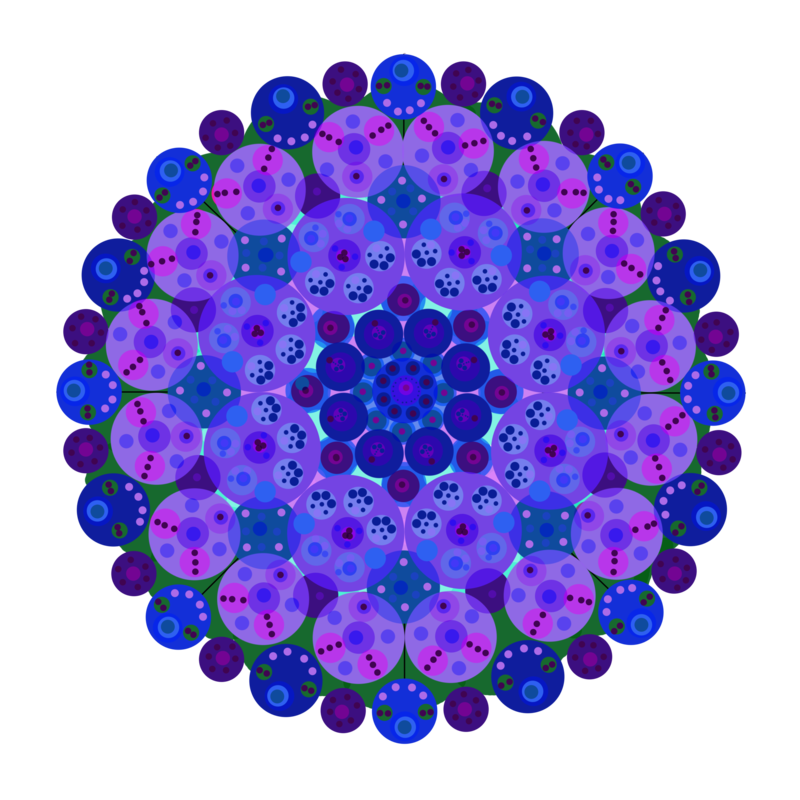 Today I have to go to Chicago, so I’ve uploaded this mandala in advance. It’s uncertain how regularly I’ll be able to update while I’m away; I’ve got a bunch of other commitments and work on which I’ve fallen behind, and I’m not likely to sleep well on this trip, or have much free time. There will be something, but I’m not sure what. 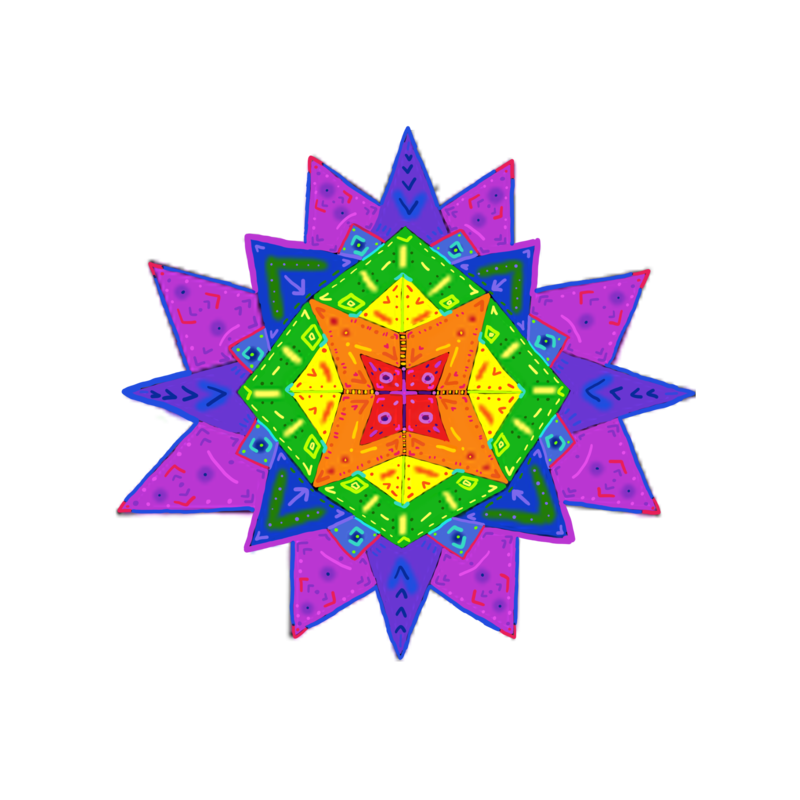 This entry was posted in mandalas and tagged digital paint, mandala on March 26, 2015 by littledragonblue.